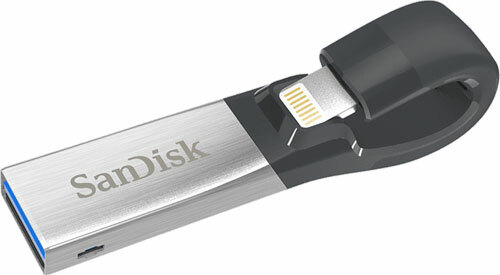 Four iPad & iPhone Flash Drives Tested - Are They Worth It? We tested four MFi-certified flash drives from ADATA, Kingston, Leef and Sandisk. These iOS-compatible drives made exclusively for iPad and iPhone promise to bring plug-n-play USB storage to the Apple's mobile platform. This category isn’t new by any means yet these dual-headed drives featured here have improved significantly over first generation products on all fronts. Granted, there are quite a few usage restrictions, but they do come in handy in situations where all other options are exhausted. To the manufacturers’ credit, these limits are largely imposed by the iOS platform rather than the drives themselves. At the end of the day, you will find these drives to be quite useful whether you need to access large-sized media files (especially non-Apple friendly ones) or to make crucial media backups where Internet connection might be costly, too slow or simply unavailable. You will be prompted to download the developer’s iOS app as soon as you plug in the drive. 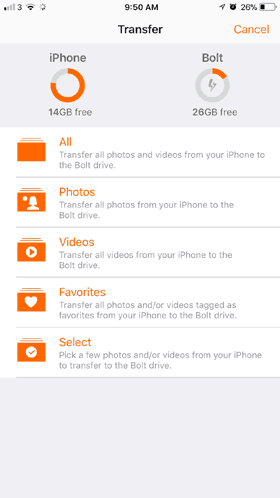 To share files with another iOS user, that person has to do the same. 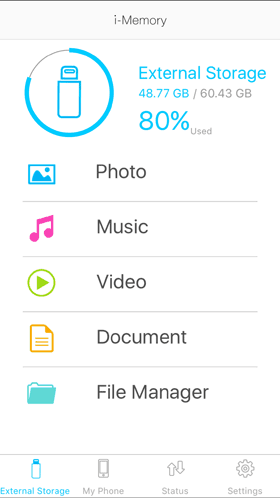 The app itself weighs between 40 and 160MB depending on your drive you choose. The iOS apps provided from the manufacturers have exclusive access right to the drives’ content. They handle pretty much everything from media playback to Camera Roll backup and restore. If you plan on carrying files larger than 4GB, pick a drive that supports exFAT. Even though you can still format it into exFAT on your PC or Mac, there’s no guarantee that the app will recognize the file table. Files that aren’t natively compatible with the manufacturers’ bundled apps have to be first copied to your iPhone or iPad before a third party app can attempt to open. This kind of defeats the purpose of having external storage; having said that, this limitation only applies to unsupported file format. Apple iOS can neither import nor play DRM-protected media from these USB sticks. This might not be a deal breaker unless you want to play your iTunes-purchased movies and TV shows directly from these drives. Depending on the size of your photo library, a complete backup of the Camera Rolls is clearly a test of one’s patience, not to mention the toll it will take on the iDevice’s battery life. For this reason, we recommend you only use these drives as an intermediary storage for your media, especially if you plan on recording 4k video. You will want a drive whose app continues to receive updates on a regular basis whether to fix bug or to keep up with iOS requirements. Note these updates, however, might stop coming as soon as the company stops production of their drives. 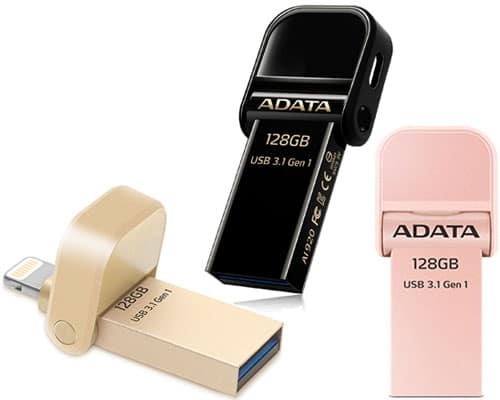 The ADATA AI920 gets credit for delivering currently the most compact of all iOS flash drives. There’s a flip that partially protects the Lightning connector and a hole on the same flip allows you to secure the AI920 to a wrist strap. Its form factor is undoubtedly a significant improvement over its bulky predecessor, which is just like any other first generation product. Hardware is only half of the equation for MFi flash drives as the accompanying app is what makes or breaks the product. Having said that, the AI920 ships with an iOS app called i-Memory that is plagued by several issues. The interface felt dated even though everything is laid out logically. There’s also an intermittent problem with thumbnails not being generated. 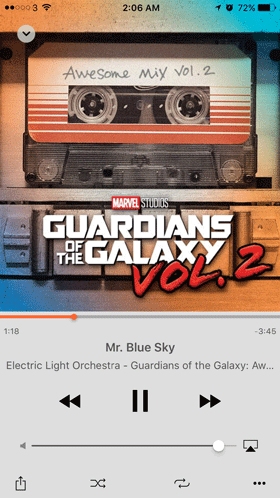 Moreover, built-in music player felt unpolished. It’s more like it’s being put together by amateurs rather than professionals who know ins and outs of usability and user experience. It even ignored our ID3 tags and album arts from our MP3s. Nevertheless, it did play our FLACs though but this still wouldn’t give the AI920 distinctive advantage. As for movie playback, we were pleasantly surprised by the app’s ability to handle all kinds of videos with rock solid stability. All these high-def MKV movies encoded at high video bit-rate include either DTS, AC3 or AAC audio codecs. Strangely enough, the player would force subtitle display (if any embedded in the file) whether or not you like it. There’s apparently no option to turn that off. ADATA AI920 – available in capacity from 32GB to 128GB – comes in choice of jet black, gold or rose gold finishes to match your iPhone. The DataTraveler Bolt is Kingston’s first shot at MFi storage. While the dual-interfaced drive doesn’t come with a fancy wrap around design as seen on its competitors, the Bolt’s metal unibody construction radiates a robust sense of durability. For extra protection, Kingston provides a perfectly fit silicone cap that can also add to a keychain. Kingston’s own iOS app seems like it’s made entirely for media backup in addition to direct photo and video capture into the Bolt. We couldn’t find a built-in media player anywhere. 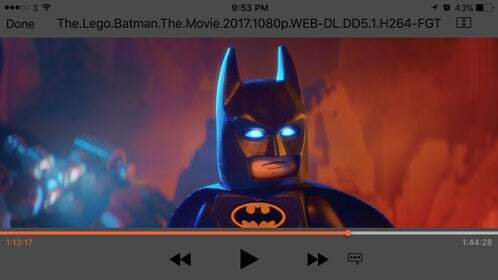 Granted, you can still play a movie from the Bolt given the file is encoded in a native format compatible with iOS but music playback is out of the question. The less tech-savvy will appreciate different backup presets in addition to the descriptive details for each function throughout the app. The Bolt, however, lacks the same kind of presets for media restore. Instead, you have to selectively import photos through iOS Share Sheet from inside the Kingston’s app. Our benchmark – carried out on an iPhone 6 plus – clocked our Bolt at 32MB/s reading from the drive and 7.8MB/s writing to it. The results put the drive on par with the performance of other iOS drives. The Kingston’s DataTraveler Bolt ships in capacities ranging from 32GB to 128GB. Leef has trimmed down its second-generation iBridge to less than half the size of its predecessor. The latest version – available in black as well as silver – is now decidedly more minimalist and sleek. It retains the original iBridge’s unobtrusive “J” shape design, which neatly curves around the back of an iPhone or iPad. Yet the most significant change is the inclusion of USB 3.1 Gen 1, which speeds up file transfer. After plugging in the iBridge, iOS will ask you whether or not to launch its in-house app. (If you don’t have it installed, you will be prompted to download it from Apple app store.) 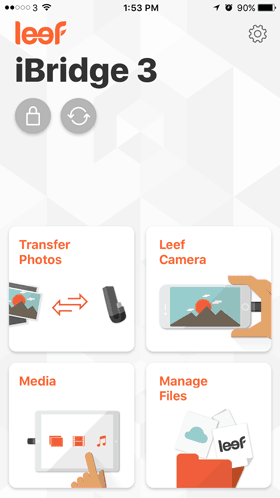 Once inside the app, you’ll be presented with 4 action options: Transfer Photos; Media; Leef Camera; and Manage Files. Each option is pretty self-explanatory. 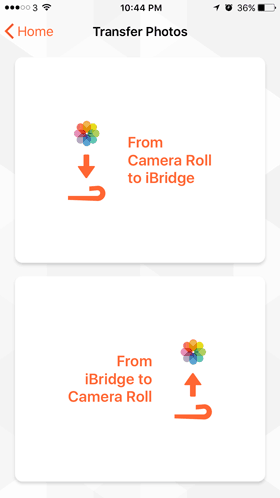 Our experience with the iBridge’s photo management was satisfying but left us wanting a bit more. 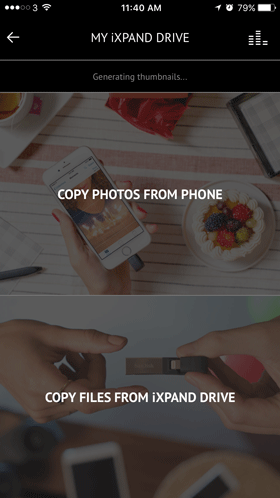 We were able to browse and share our snapshots in a manner similar to Apple’s Photos apps. Photos – grouped by date – are displayed in grid but there’s no support for albums even if you organize the photos in separate folders yourself. 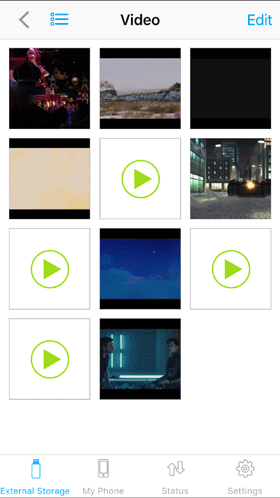 And strangely, videos imported from iPhone are shown alongside other pictures when there’s clearly a seperate content tab for video. Video and photos taken via iBridge’s own camera are saved directly into the iBridge. Though, the camera interface offers only rudimentary functions and all settings appear to be defaulted to auto mode. Full HD video recording is also limited to 30fps even though our iPhone 6 can record at a maximum of 60fps. With this version of iBridge, Leef has fixed the performance issue associated with waiting for the drive to finish saving snapshot or video. iBridge’s movie player was quite capable. It was able to handle our 1080p MKVs encoded with DTS and AC3 audio with ease. This is a big thumbs up. Our high bit-rate MP4s downloaded from YouTube and decade-old AVI archive also played without any hiccups. Leef, however, has removed the ability to rewind and fast forward time during playback by swiping. We missed scrubbing back and forth as it allowed a much more precise control of the desired time point in a video. Most of us should also rejoice for the fact that the iBridge 3 has finally brought the much needed support for exFAT, which lifts the 4GB file size restriction. 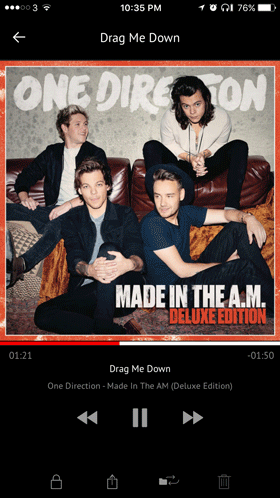 Music player accessible via the Media section delivers a user-friendly experience. 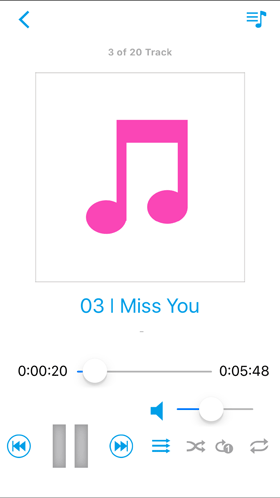 It was able to consolidate our MP3s and AACs located across different folders on iBridge as well as ones on our iPhone into a unified music library. This could take a minute or so depending on the number of songs. 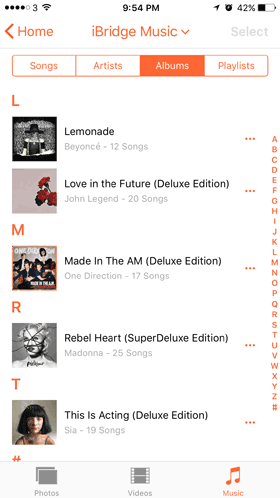 The player’s minimalist, yet intuitive interface lists songs, albums and artists alphabetically, complete with album art display. We were equally impressed with its built-in contextual search. In terms of speeds, the iBridge 3 falls in the middle of the pack. Our drive benchmark clocked in at 19MB/s reading a 3GB off the drive and 7.8MB/s writing to it. Tests were conducted on an iPhone 6 Plus. You can expect better performance from a Kingston or Sandisk, however. 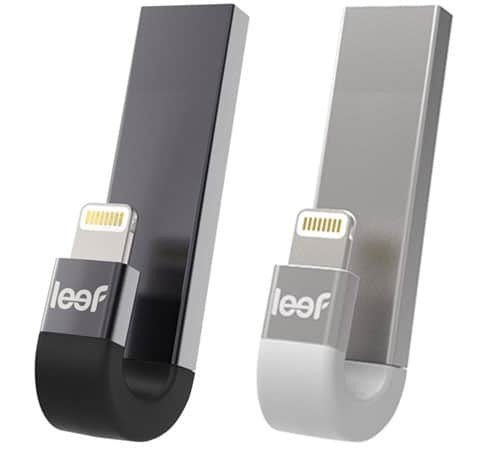 The Leef iBridge 3 ships in silver and black while 16GB and 256GB are only available in latter color. The second iteration of iXpand is miles better than its predecessor. Despite the fact that drive takes a similar design approach to that of Leef’s iBridge, the much improved iXpand runs faster and stays unobtrusive during daily use. Dropping the need to recharge the drive’s built-in battery is also a big step up in terms of usability. Plugging in iXpand V2 into our iPhone’s Lightning port pops up a message saying if we wanted to launch its associated app. Once inside the app, the first thing we noticed was that a lot of thought went into the features for iOS users who don’t rely on iCloud (or even iTunes) for data syncing. They include everything from different backup options to multimedia file support. Incremental backup for photos and contacts can be set to automatically begin as soon as iXpand is connected. However, waiting for the drive to complete the first full backup is a test of your patience if you have a sizable photo library. Photos are then logically organized in subfolders based on the year and month the files are created. 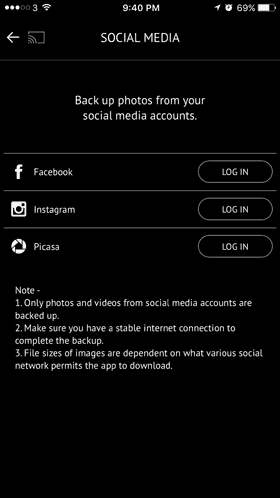 The app can also download pictures and videos into iXpand directly from social media sites from the likes of Facebook and Instagram. Once backup is complete, the files are saved into folders of the same name as the album titles originally given on Facebook. 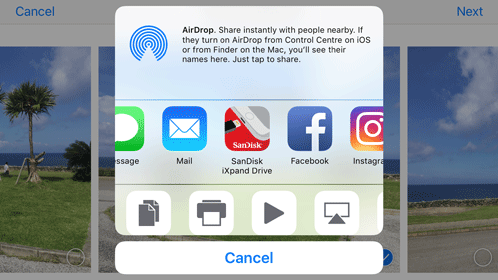 Sandisk gets bonus points for supporting iOS Share Sheet extension so you can send files over AirDrop and to other apps from iXpand. Likewise, native iOS apps (e.g. 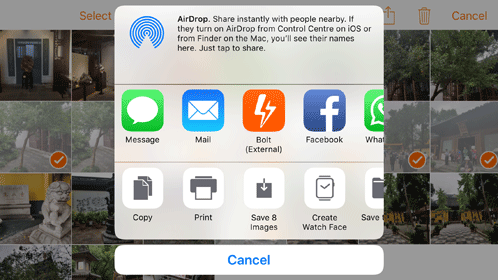 Photos) can transfer media or documents directly to iXpand drive with the same iOS’ Share Sheet extension. Also worth noting is the data transfer rate between iOS device and the drive. According to our tests, the Sandisk was the fastest (29MB/s to iPhone; 13.5MB/s to iXpand) when compared to Leef’s iBridge 3 and ADATA’s AI920. These results were obtained through benchmarks on our iPhone 6. Expect better performance when these drives are paired with USB 3.0-equipped iPhone 7 and second generation of iPad Pro. 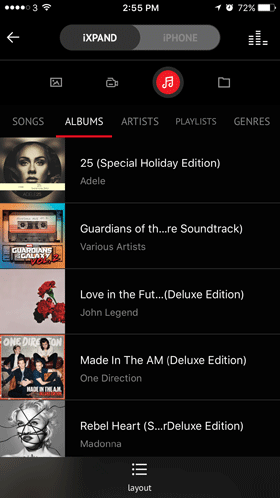 As for the audio player, the Sandisk app was able to build a library from the songs already in the Apple’s Music app as well as the MP3s and AACs on our iXpand. The load time was slightly longer than expected and the player also couldn’t read any of the tags and album art embedded in our FLAC lossless files. 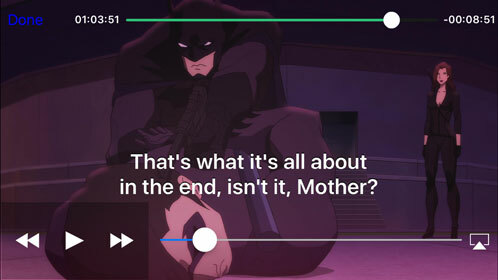 Our full HD MKVs encoded with multiple audio streams as well as subtitles were handled beautifully. The app even allowed you to continue playback where you left off previously. There’s one caveat. DTS audio is not on the list of supported audio. A workaround is to get Infuse Pro. It’s is full-featured multimedia player for iOS that works with iXpand natively via Sandisk’s API. When we say full-featured, it means virtually every known media type and codec are supported. Sandisk’s iXpand V2 is available from 16GB to 256GB but as far as we know, only the 128GB and 256GB variant come with support for exFAT. 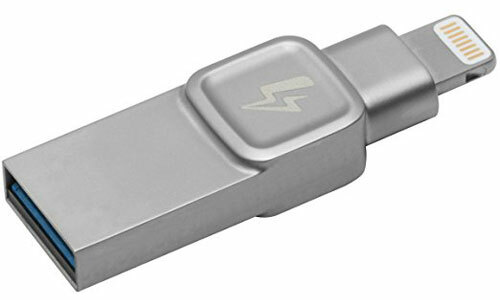 Riding the wave of iPhone worldwide popularity, MFi USB sticks are popping up left and right. They promise a seamless file syncing experience for iOS users who prefer keeping things as simple and straightforward as possible. In the end, what we found out Leef iBridge 3 and Sandisk iXpand V2 with their robust media player and feature-packed iOS app are the most versatile of the four MFi drives tested. The latter also delivers the best Lightning performance we’ve tested. Having said that, Kingston has its own merits – being the most durable as well as having a polished user interface. It might want to throw in a few extra app features to keep up with competition. Lastly, there’s nothing really wrong with ADATA AI920’s hardware. It’s just that their app feels like a work in progress and desperately needs a major overhaul. If you have experience with any MFi flash drives or if you would simply like to us to review another one instead, share with us in the comments below!